So that’s the history lesson. Because I haven’t sought out the back catalogue (yet), this review lacks comparisons. 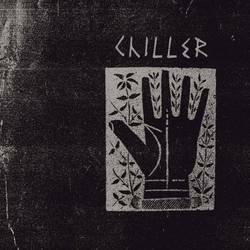 Instead, it focuses on Chiller today. Their sound is one of those styles I have trouble putting to words. It’s punk at its broadest, with garage rock and power pop influences seeping in throughout. Besides all the previous band namedropping earlier, it also reminds me of label mates Low Culture, particularly in Eric’s vocals. While the songs throughout the self-titled debut are in that vague garage-punk world, most notably by the heavy use of cymbals and the powerful drums, they have depth and nuance that stretches the gamut of different styles. Summarized on their Facebook “about” page, the band is into minor chords. “Satisfied” has meandering desert rock guitar that leads seamlessly into group harmonies, and the rest of the album balances soothing harmony within nuance songwriting. Each song is unique, but unified by Ilisha and Eric’s harmonies. Eric’s songs lean more in the pop realm, while the songs with Ilisha on the mic tend to be more meandering, with her vocals leading the song instead of building to the a cumulative group-sung chorus. When there’s no harmony, vocals tend to punctuate the beat. Speaking to the tone, both singers cue into the music to provide a contemplative and searching vibe with moments of cathartic unity. When the band uses harmonies, they tend to catapult the song into an emotional realm that’s meaningful, yet balanced enough to avoid being tagged as dramatic. Personal favorites are “Monophonic” with its standout harmonies and the following track, “Offred,” with emphatic tone-shifting vocals from Ilisha with just a few vocal tradeoffs for added punch. It’s not a technique they use often on the 8-song record and, used sparingly, it works to powerful effect between the two different singers’ styles. Album ender “Unanswered” starts off with soft vocals from Eric, almost ballad-esque, before it crescendos into a big emotional finish. “Strangers” and "The Void" also stand out for different reasons. This is a really good record, and one that holds up well on repeat. While its genre foundation is known more for high energy and repetition, the band adds layers and texture to each song that make them stand out from one another and to provide meaning long-term instead of just a one-play-and-done energy burner. Listening to the record clears the mind. It makes you feel chiller. Posted March 5, 2018, 6:23 p.m.